'Our client results are how we measure success of Leadership Direct,' said Ray Carvey, executive vice president of Corporate Learning and International at Harvard Business Publishing. 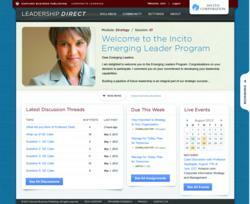 Harvard Business Publishing Corporate Learning (http://www.harvardbusiness.org) announced substantial features and functionality in the new release of the platform for its Leadership Direct program. Leadership Direct is the organization’s cohort-based, virtual blended leadership development program that helps senior-level and high-potential leaders develop and refine their general management capabilities. Leadership Direct’s new platform delivers an enhanced user experience, based on feedback from participants and administrators for Leadership Direct-based programs. These new features and functionality enhance Leadership Direct’s participant-centered learning approach that encourages reflection, discussion, and critical thinking. Streamlined access to program content and resources – Improved user interface with simple navigation and an integrated syllabus make it easy to access program components, and get a clear view of current and upcoming assignments and events. Improved collaboration and networking – Redesigned discussion boards and community page improve communication between program participants, who often represent multiple business units and/or geographies. Ability to contextualize the programs – Customizable sections of the portal include a dedicated area for posting messages or videos throughout the program and configurable widgets that appear on the portal home page, such as a live event calendar, FAQs, company logos, or a company message, among other elements. Improved progress tracking and reporting – Enhanced metrics measure results and impact. Harvard Business Publishing Corporate Learning partners with clients to create world-class leadership development solutions for managers at all levels. We leverage the management insight, thought leadership, and expertise of Harvard Business School faculty and authors from Harvard Business Review to create tailored leadership development solutions. With more than 20 years of practical experience, our innovative, technology-enabled solutions drive meaningful and lasting business results. Corporate Learning is a market group within Harvard Business Publishing. For more information, visit http://www.harvardbusiness.org. Follow us on Twitter https://twitter.com/HBPCorpLearning and connect with other talent development leaders on LinkedIn through the Harvard Business Publishing Corporate Learning Group.